Intellectual Ventures Management LLC emerged as one of the top patent buyers in the U.S. brokered market in the fourth quarter of 2016, after a year of sporadic buying activity from the patent licensing company, according to data reviewed by Bloomberg BNA. Through two of its subsidiaries, the Bellevue, Wash.-based Intellectual Ventures escalated its buying activity by purchasing a total of 172 assets, compared with no purchases in the same period a year ago, according to data provided by Richardson Oliver Law Group LLP (ROL). ROL advises companies on patent acquisitions in the brokered market. Intellectual Ventures’ activity on the brokered market declined last year when it bought no assets in the first and third quarters and made a small purchase of eight assets in the second quarter. Known for buying patents, charging companies to license its IP and suing them if they use it without permission, privately-held Intellectual Ventures is closely watched in the patent market. After a funding round in 2013, Intellectual Ventures went on a buying spree in the brokered patent market in 2014 and 2015, buying 4,679 and 1,777 assets, respectively, according to ROL data. In comparison, it bought a total of 180 assets in 2016. Compared to previous years, though, Intellectual Ventures is now “much more selective in what they buy and their resources are limited,” Richardson said. ROL Group tracks the reassignment of patents from various listed packages, comprising numerous assets for sale, to identify when a sale is executed. Due to a lag in recording reassignments at the Patent and Trademark Office, ROL Group assumes that a given package is sold if any of the U.S. patents listed in the package are shown as reassigned in the PTO’s system. Intellectual Ventures could not immediately be reached for comment. Founded in 2000 by former Microsoft Corp. Chief Technology Officer Nathan Myrhvold, Intellectual Ventures has raised over $6 billion to purchase patents and owns around 70,000 intellectual property assets, according to its website. The company has 40,000 intellectual property assets in programs to grow revenue through licensing and related litigation. In the fourth quarter of 2016, Intellectual Ventures purchased patents in the brokered market from Japanese electronics maker Panasonic Corp. related to wireless communication technology and electric motor-driving devices used in appliances such as air-conditioners, according to patent assignment listings on the PTO’s website. It also bought patents on technology that connects computer networks and users of cloud computing from computer programming services company Adaptive Computing Inc. Brokers can help companies acquire patents in fields where competitors and likely legal adversaries operate, giving them defensive leverage against infringement claims. 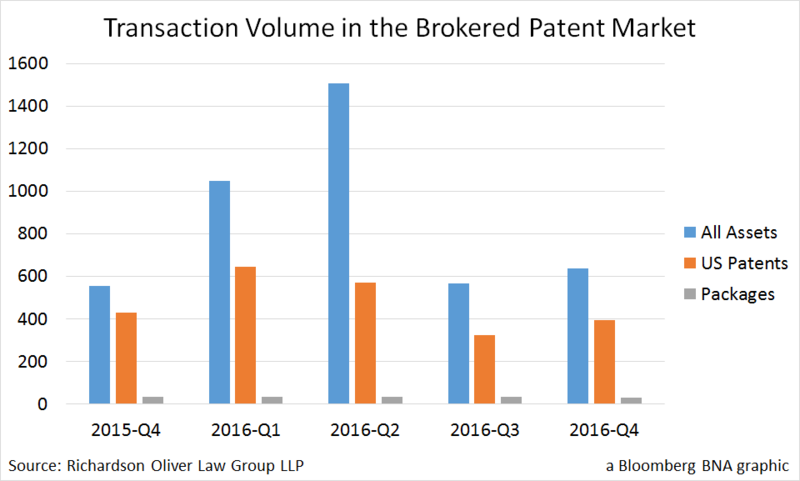 While the brokered market represents a small portion of the overall market for patent sales between companies, it can help illustrate broader trends. For instance, the number of cloud computing and semiconductor technology patent assets spiked in the fourth quarter of 2016. In the third quarter, the fast-growing cloud computing market saw 123 patent assets in eight deals or packages sold, compared to three deals involving 67 assets in the third quarter. The U.S. Supreme Court’s June 2014 decision in Alice Corp. v. CLS Bank Int’l resulted in the invalidation of hundreds of software patents for covering ineligible abstract ideas. Recent case law and regulation have increased the risk related to buying software and business method patents, including e-commerce and financial technology patents. Buyers, including Intellectual Ventures, see less risk in semiconductor technology and cloud computing patent purchases, Richardson said. A transaction involving semiconductor technology patents by Mitsubishi Group to electronics component maker Murata Manufacturing Co. Ltd. appeared to be one of the top sales with the largest number of assets sold in the quarter, according to data from ROL and the PTO’s online assignment listings. Pressured by tough competition from Taiwan and China, some of Japan’s electronics makers have begun selling off and licensing patents in recent years, Richardson said. Since 2014, at least half of the top ten sales in the brokered patent market have been semiconductor deals, he added. The number of assets available in the market dropped 13.2 percent to 2,478 new assets in the fourth quarter from the previous quarter. The number of patent packages listed rose 3.5 percent to 147 from the third quarter. 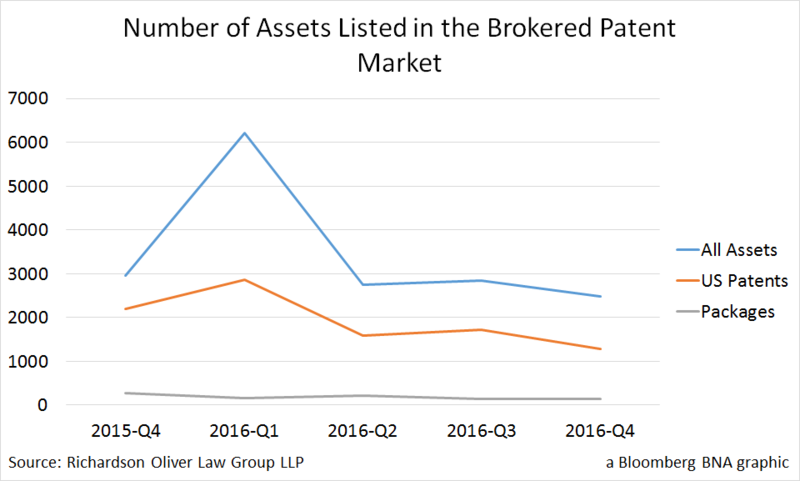 However, 2,855 assets listed in the third quarter were offered in a smaller number of patent packages . 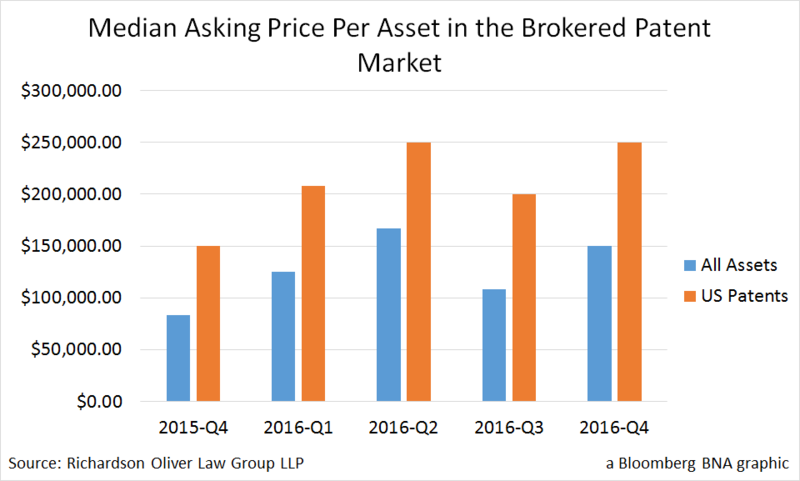 The median asking price per new asset listed by patent brokers was $150,000 in the fourth quarter. That reflected increases of 38 percent from the previous quarter and 80 percent from the fourth quarter of 2015.